Andrew, like his brother Simon Peter, was a fisherman. He became a disciple of the great St. John the Baptist, but when John pointed to Jesus and said, “Behold the Lamb of God!” Andrew understood that Jesus was greater. At once he left John to follow the Divine Master. Jesus knew that Andrew was walking behind him, and turning back, he asked, “what do you seek?” When Andrew answered that he would like to know where Jesus lived, Our Lord replied, “Come and see.” Andrew had been only a little time with Jesus when he realized that this was truly the Messiah. From then on, he chose to follow Jesus. Andrew was thus the first disciple of Christ. Next, Andrew brought his brother Simon (St. Peter) to Jesus and Jesus received him, too, as His disciple. At first the two brothers continued to carry on their fishing trade and family affairs, but later, the Lord called them to stay with Him all the time. He promised to make them fishers of men, and this time, they left their nets for good. It is believed that after Our Lord ascended into Heaven, St. Andrew went to Greece to preach the gospel. He is said to have been put to death on a cross, to which he was tied, not nailed. He lived two days in that state of suffering, still preaching to the people who gathered around their beloved Apostle. Two countries have chosen St. Andrew as their patron – Russia and Scotland. 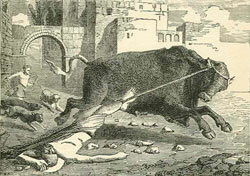 St. Saturninus Bishop of Toulouse and Martyr November 29 A.D. 257 St. Saturninus went from Rome by the direction of pope Fabian, about the year 245, to preach the faith in Gaul, where St. Trophimus, the first bishop of Arles, had some time before gathered a plentiful harvest. In the year 250, when Decius and Gratus were consuls, St. Saturninus fixed his episcopal see at Toulouse. Fortunatus tells us, that he converted a great number of idolaters by his preaching and miracles. This is all the account we have of him till the time of his holy martyrdom. The author of his acts, who wrote about fifty years after his death, relates, that he assembled his flock in a small church; and that the capitol, which was the chief temple in the city, lay in the way between that church and the saint’s habitation. In this temple oracles were given; but the devils were struck dumb by the presence of the saint as he passed that way. The priests spied him one day going by, and seized and dragged him into the temple. declaring that he should either appease the offended deities by offering sacrifice to them, or expiate the crime with his blood. Saturninus boldly replied: “I adore one only God, and to him I am ready to offer a sacrifice of praise. Your gods are devils, and are more delighted with the sacrifice of your souls than with those of your bullocks. How can I fear them who, as you acknowledge, tremble before a Christian?” The infidels, incensed at this reply, abused the saint with all the rage that a mad zeal could inspire, and after a great variety of indignities, tied his feet to a wild bull, which was brought thither to be sacrificed. The beast being driven from the temple, ran violently down the hill, so that the martyr’s scull was broken, and his brains dashed out. His happy soul was released from the body by death, and fled to the kingdom of peace and glory, and the bull continued to drag the sacred body, and the limbs and blood were scattered on every side, till, the cord breaking, what remained of the trunk was left in the plain without the gates of the city. Two devout women laid the sacred remains on a bier, and hid them in a deep ditch, to secure them from any further insult, where they lay in “wooden coffin” till the reign of Constantine the Great. Then Hilary, bishop of Toulouse, built a small chapel over this his holy predecessor’s body Sylvius, bishop of that city towards the close of the fourth century, began to build a magnificent church in honor of the martyr, which was finished and consecrated by his successor Exuperius, who, with great pomp and piety, translated the venerable relics into it. This precious treasure remains there to this day with due honor. The martyrdom of this saint probably happened m the reign of Valerian, in 257. On July 18, the first apparition occurred in the community’s motherhouse. St. Catherine beheld a lady seated on the right side of the sanctuary. When St. Catherine approached her, the heavenly visitor told her how to act in time of trial and pointed to the altar as the source of all consolation. Promising to entrust St. Catherine with a mission which would cause her great suffering, the lady also predicted the anticlerical revolt which occurred at Paris in 1870. On November 27, the lady showed St. Catherine the medal of the Immaculate Conception, now universally known as the “Miraculous Medal.” She commissioned St. Catherine to have one made, and to spread devotion to this medal. At that time, only her spiritual director, Father Aladel, knew of the apparitions. Forty-five years later, St. Catherine spoke fully of the apparitions to one of her superiors. 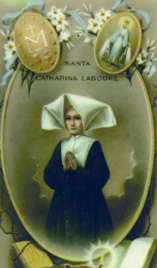 She died on December 31, 1876, and was canonized on July 27, 1947. Her feast day is November 28. James was a favorite of King Yezdigerd I of Persia and a Christian. He abandoned his religion when Yesdigerd launched a persecution of the Christians. When the king died, James repented of his apostasy and declared himself to be a Christian to the new king, Bahram. When James refused to apostasize, he was executed by having his body cut apart piece by piece, beginning with his fingers (hence his surname Intercisus – cut to pieces), and then beheaded. His feast day is November 27. Eldest son of a shoemaker, John was born at Diest, Brabant. He early wanted to be a priest, and when thirteen became a servant in the household of one of the Cathedral canons at Malines, John Froymont. In 1615, he entered the newly founded Jesuit College at Malines, and the following year became a Jesuit novice. He was sent to Rome in 1618 to continue his studies, and was known for his diligence and piety, impressing all with his holiness and stress on perfection in little things. He died there on August 13. 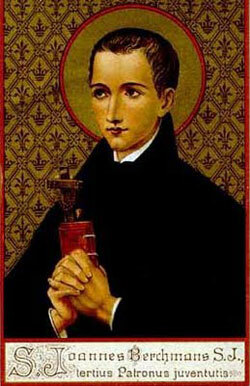 Many miracles were attributed to him after his death, and he was canonized in 1888. He is the patron of altar boys. 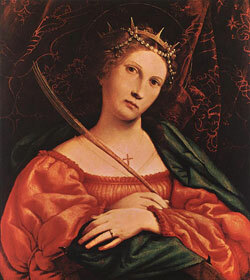 St. Catherine of Alexandria, Virgin and Martyr whose feast day is November 25th. She is the patroness of philosophers and preachers. St. Catherine is believed to have been born in Alexandria of a noble family. Converted to Christianity through a vision, she denounced Maxentius for persecuting Christians. Fifty of her converts were then burned to death by Maxentius. Maxentius offered Catherine a royal marriage if she would deny the Faith. Her refusal landed her in prison. While in prison, and while Maxentius was away, Catherine converted Maxentius’ wife and two hundred of his soldiers. He had them all put to death. Catherine was likewise condemned to death. She was put on a spiked wheel, and when the wheel broke, she was beheaded. She is venerated as the patroness of philosophers and preachers. St. Catherine’s was one of the voices heard by St. Joan of Arc. Maxentius’ blind fury against St. Catherine is symbolic of the anger of the world in the face of truth and justice. When we live a life of truth and justice, we can expect the forces of evil to oppose us. Our perseverance in good, however, will be everlasting. Through the missionary efforts of various religious families beginning in the sixteenth century and continuing until 1866, the Vietnamese people heard the message of the gospel, and many accepted it despite persecution and even death. On June 19, 1988, Pope John Paul II canonized 117 persons martyred in the eighteenth century. Among these were ninety-six Vietnamese, eleven missionaries born in Spain and belonging to the Order of Preachers, and ten French missionaries belonging to the Paris Foreign Mission Society. Among these saints are eight Spanish and French bishops, fifty priests (thirteen European and thirty-seven Vietnamese), and fifty-nine lay people. These martyrs gave their lives not only for the Church but for their country as well. They showed that they wanted the gospel of Christ to take root in their people and contribute to the good of their homeland. 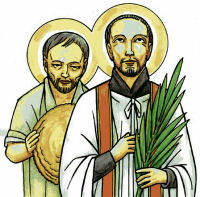 On June 1, 1989, these holy martyrs were inscribed in the liturgical calendar of the Universal Church on November 24th. Born on January 13, 1891 in Guadalupe, Mexico, Miguel Agustin Pro Juarez was the eldest son of Miguel Pro and Josefa Juarez. Miguelito, as his doting family called him, was, from an early age, intensely spiritual and equally intense in hi mischievousness, frequently exasperating his family with his humor and practical jokes. As a child, he had a daring precociouness that sometimes went too far, tossing him into near-death accidents and illnesses. On regaining consciousness after one of these episodes, young Miguel opened his eyes and blurted out to his frantic parents, “I want some cocol” (a colloquial term for his favorite sweet bread). “Cocol” became his nickname, which he would later adopt as a code name during this clandestine ministry. Miguel was particularly close to his older sister and after she entered a cloistered convent, he came to recognize his own vocation to the priesthood. 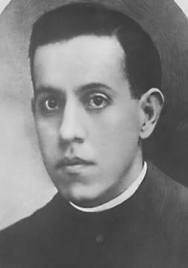 Although he was popular with the senoritas and had prospects of a lucrative career managing his father’s thriving business concerns, Miguel renounced everything for Christ his King and entered the Jesuit novitiate in El Llano, Michoacan in 1911. He studied in Mexico until 1914, when a tidal wave of anti-Catholicism crashed down upon Mexico, forcing the novitiate to disband and flee to the United States, where Miguel and his brother seminarians treked through Texas and New Mexico before arriving at the Jesuit house in Los Gatos, California. In 1915, Miguel was sent to a seminary in Spain, where he remained until 1924, when he went to Belgium for his ordination to the priesthood in 1925. Miguel suffered from a severe stomach problem and after three operations, when his health did not improve, his superiors, in 1926, allowed him to return to Mexico in spite of the grave religious persecution in that country. The churches were closed and priests went into hiding. Miguel spent the rest of his life in a secret ministry to the sturdy Mexican Catholics. In addition to fulfilling their spiritual needs, he also carried out the works of mercy by assisting the poor in Mexico City with their temporal needs. He adopted many interesting disguises in carrying out his secret mininstry. He would come in the middle of the night dressed as a beggar to baptize infants, bless marriages and celebrate Mass. He would appear in jail dressed as a police officer to bring Holy Viaticum to condemned Catholics. When going to fashionable neighboorhoods to procure for the poor, he would show up at the doorstep dressed as a fashionable businessmam with a fresh flower on his lapel. His many exploits could rival those of the most daring spies. In all that he did, however, Fr. 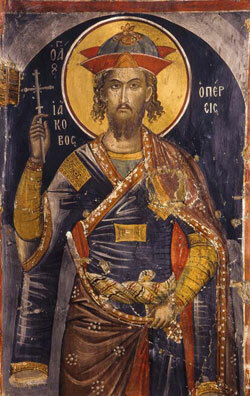 Pro remained obedient to his superiors and was filled with the joy of serving Christ, his King. Falsely accused in the bombing attempt on a former Mexican president, Miguel became a wanted man. Betrayed to the police, he was sentenced to death without the benefit of any legal process. Information courtesy of ProVision and Brother Gerald Mueller. In the fourth century a Greek religious romance on the Loves of Cecilia and Valerian was written in glorification of virginal life with the purpose of taking the place of then-popular sensual romances. Consequently, until better evidence is produced, we must conclude that St. Cecilia was not known or venerated in Rome until about the time when Pope Gelasius (496) introduced her name into his Sacramentary. 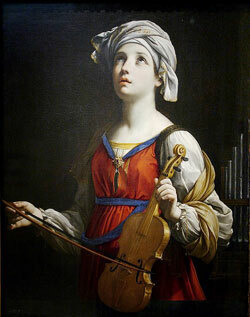 It is said that there was a church dedicated to St. Cecilia in Rome in the fifth century, in which Pope Symmachus held a council in 500. During her wedding ceremony she was said to have sung in her heart to God and before the consummation of her nuptials, she told her husband she had taken a vow of virginity and had an angel protecting her. Valerian asked to see the angel as proof, and Cecilia told him he would have eyes to see once he traveled to the third milestone on the Via Appia (Appian Way) and was baptized by Pope Urbanus. Following his baptism, Valerian returned to his wife and found an angel at her side. The angel then crowned Cecilia with a chaplet of rose and lily and when Valerian’s brother, Tibertius, heard of the angel and his brother’s baptism, he also was baptized and together the brothers dedicated their lives to burying the saints who were murdered each day by the prefect of the city, Turcius Almachius. Cecilia was later arrested and condemned to be suffocated in the baths. She was shut in for one night and one day, as fires were heaped up and stoked to a terrifying heat – but Cecilia did not even sweat. St. Cecilia’s remains were transferred to Cecilia’s titular church in Trastevere and placed under the high altar. In 1599 Cardinal Paolo Emilio Sfondrati, nephew of Pope Gregory XIV, rebuilt the church of St. Cecilia. 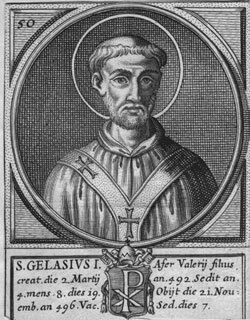 St. Gelasius I, Pope (Feast day – November 21) Gelasius was born in Rome, in the fifth century, the son of an African named Valerius. Later, ordained a priest, he was elected Pope on March 1st, 492. Gelasius had a reputation for learning, justice, holiness, and charity. However, he was burdened with difficulties caused by a conflict with Euphemius, the Patriarch of Constantinople, over the Acacian heresy. He also protested the encroachments by Constantinople on Alexandria and Antioch. Gelasius was influential in setting aside Roman pagan festivals. Moreover, in opposition to the Manichaeans, he ordered reception of the Eucharist under both species. Gelasius is known to have composed liturgical Prefaces and Orations for Sacramentaries, which may be part of the Leonine Sacramentary. However, he had nothing to do with the Gelasian Sacramentary or the Gelasian Decree (listing the Canonical books of the Bible) – which have been erroneously attributed to him. He died at Rome on November 21, 496.